I’m not sure when I realized that I wanted to be part of the babywearing ‘thing’, to join in the other mothers who wore their babies. It must have been mid to late in my pregnancy and it was probably solidified when I saw someone at the infant CPR class with a wrap that I had never seen before. She so casually threw her ten month old on her back in this beautiful wrap that made me all glittery eyed. What was that wrap?, I asked her. She replied that it was a woven wrap and when I got home that evening I Googled ‘woven wrap‘ thinking it was a particular brand. Nope, not even close, it was a class of wraps, and some seemed quite expensive. 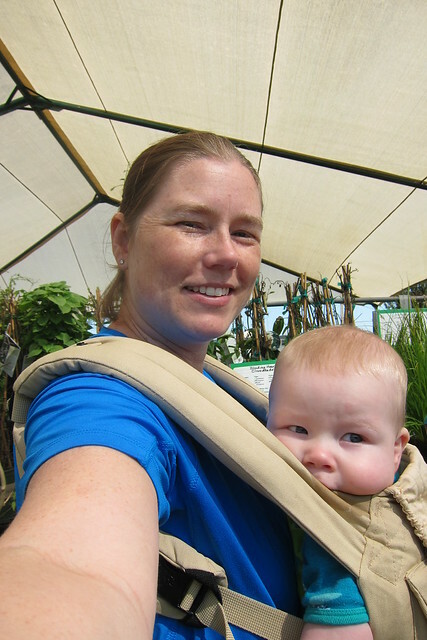 Once I delved into the babywearing world a little bit I saw that it was quite a hobby. 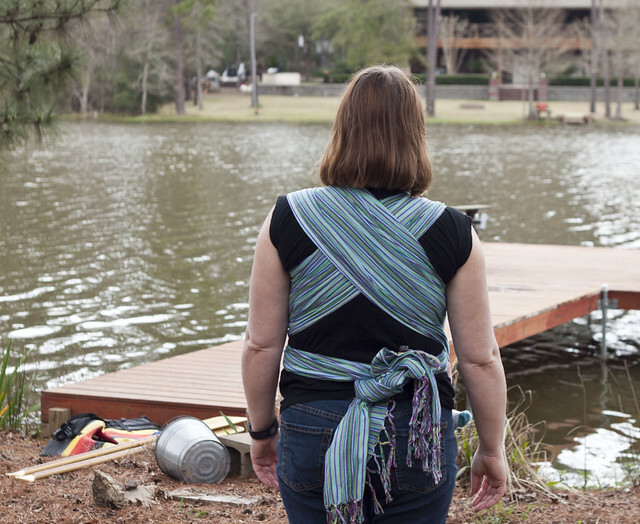 I knew of the Moby wraps and had read about the Ergo carriers, which I’d decided I wanted, and also knew I wanted something more rugged for backpacking which is where I found out about the Osprey Poco Premium pack that we now have, but all of those fancy woven wraps…they were a world unto their own. 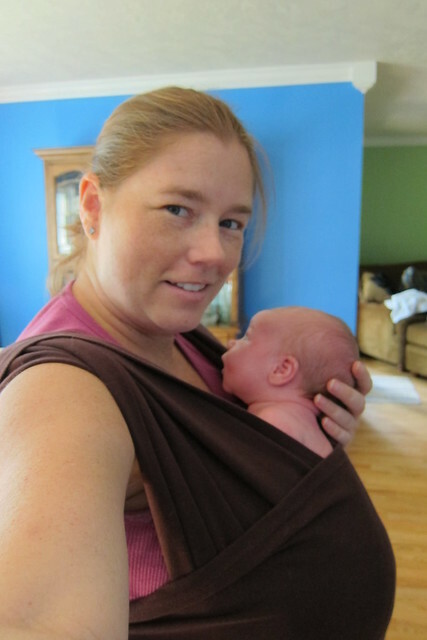 In the beginning I used the Moby wrap a few times to do some chores around the house when Forest was still tiny. He wanted to be held and I had things to do and it seemed to work pretty well for running out to hang diapers up in those early days or do light chores in the kitchen. The Moby quickly proved to be too stretchy as he got bigger and I didn’t use it nearly as much as I thought I would. 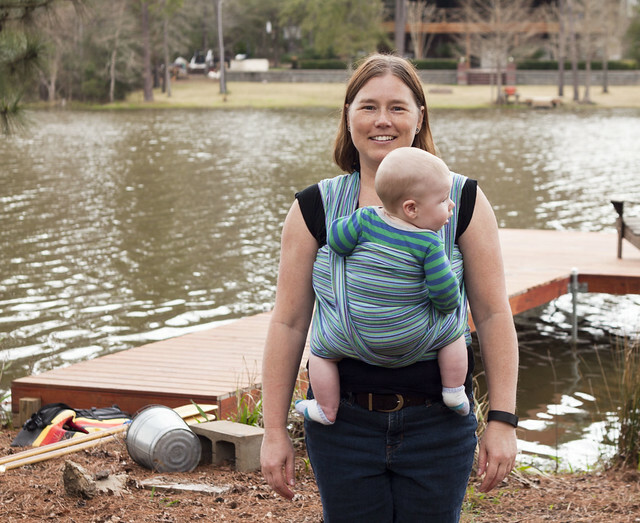 Then I began tinkering with the Ergo carrier, using the infant insert for extra support. That I quickly learned could be quite hot in our summer and early fall here in Texas so I didn’t use it outside all that much until it cooled off. I used it a few times to go to the breastfeeding group because lugging the carseat with Forest in it the one time I tried was extremely uncomfortable after a hundred yards—I had further to travel than that to get to the room in the hospital where the meeting is held. I stated using the Ergo more last November when we went to Austin for Thanksgiving. It always took him a few minutes to settle in with a bit of fussing but some shhhhing, and bouncing and swaying eased him into it pretty well. After that I knew I wanted to use it more for running around in the yard and doing some errands so I tried to find opportunities to put him in it even if it was just to walk out to check the mail. I wanted to be more mobile with him, not feeling tied do the stroller, car seat, or to carrying him on my arm which had started to get painful since he was such a big dude. 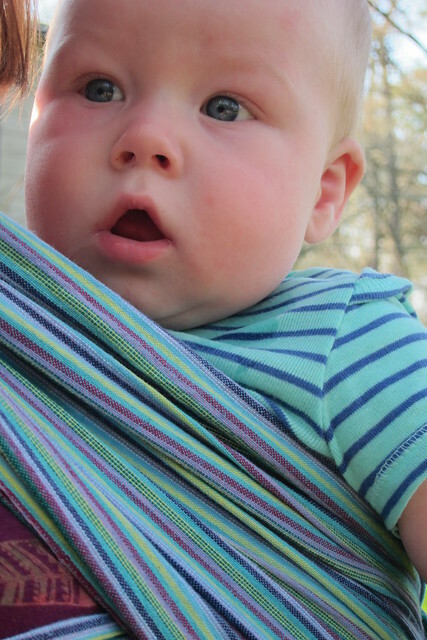 Plus, I knew *he* didn’t even want to always be lying down in the car seat or stroller. At Christmas when Chris asked what I wanted one of the items I asked for was a pea coat. I have a nice leather jacket but it is probably nearing ten years old and I had always wanted a pea coat. In the end his mom got it for me but because I was (and still am) carrying pregnancy weight it didn’t quite fit. Since they had bought it on Amazon it was relatively painless to return and I debated whether or not to get a bigger size or just wait until the next season when I would have lost more weight and have been closer to my regular size and could buy a coat that would last for several seasons. In the end I decided to wait but couldn’t figure out what I wanted to buy with the Amazon gift certificate that had been issued upon return of the coat. The woven wraps were still tantalizing and so I started looking for some of the popular brands on Amazon to see if they were available and if they were any cheaper. One brand that came up was Ellaroo and it was a more mid-priced wrap that I thought was much more affordable than some of the others out there. I had been part of several baby wearing Facebook groups for many months and decided to ask a Houston group what their opinion was on this particular brand. My reason for going for a wrap was for a cooler option for Texas’ summer months since I knew the Ergo could be hot at times. I got great feedback that the Ellaroo was one of the lighter wraps and would work pretty well for our heat and since it was in my price range I eyed it heavily. 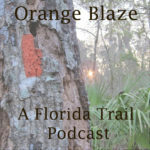 I continued to debate about it for a few weeks, reading about various brands and just wondering if I would like it and if Forest would like it. Finally I bit the bullet and ordered it. I figured if it didn’t work out that I could resell it in one of the groups of Craigslist or return it to Amazon. When it arrived I was enamored because it was beautiful! I watched a few videos on You Tube on the front wrap cross-carry (FWCC) and tried it alone a few times before putting Forest in it. I tried at least twice with Forest before figuring out how to pull it tight enough for a secure carry and being comfortable enough with walking around with him in it. Then I had Chris take a few photos of of my wrap job and asked the group I’d previously consulted to see if it looked alright. They thought it looked fine and asked if I felt secure, which I did. 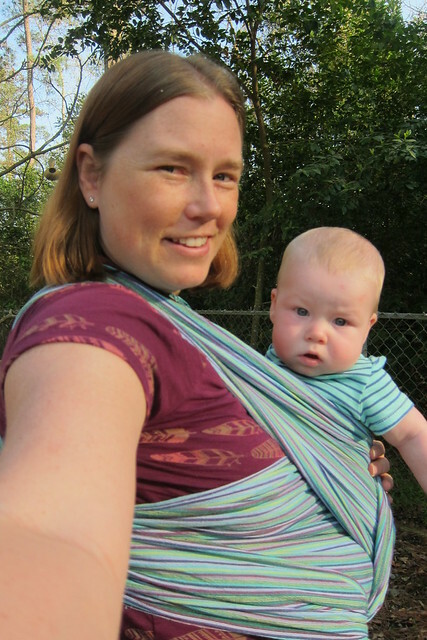 The best thing with the wrap is that Forest didn’t fuss nearly as much at the beginning when I put him versus when I put him in the Ergo. Since then I have mostly worn the Ellaroo around the yard or house but I have worn it at the grocery store twice. The first time I did a quick and not nearly as good wrap job because I ended up rushed due to someone trying to park in the space next to us where I was working on getting the wrap done. Forest fidgeted quite a bit in it while we shopped and then needed a diaper change and then I was frustrated so I left Chris to finish checking out and just carried Forest out to the truck to wait. The second time I parked at the back of the lot and took my time getting the wrap done right and feeling secure and off we went. Now that Forest is bigger and more alert and awake instead of sleeping as soon as we get in the car, I’ll probably babywear him more often when doing errands instead of putting his car seat into the cart. Plus, soon he’ll be sitting up and I’ll be able to put him in the cart to sit in the front if he gets tired of being in the wrap or Ergo. Wearing your baby in public will definitely get attention, which is something that I’m not overly fond of…people tend to creep into personal space a lot more when there’s a cute baby involved. 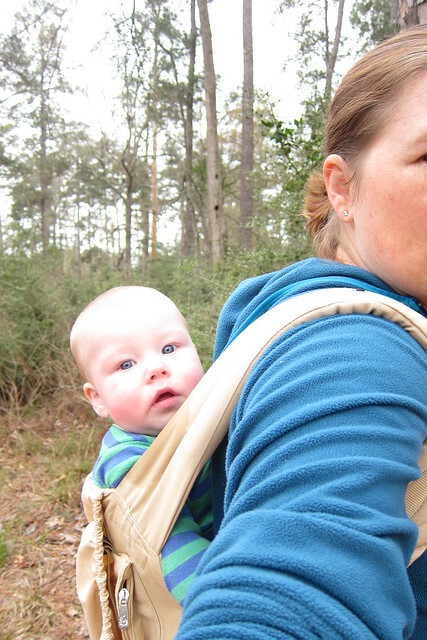 So far I love babywearing and Forest loves it too. He gets into periods when he wants out and that’s usually because he’s hungry, needs a diaper change, or it is nap time. Plus, he likes to stretch out, too. Since I now feel comfortable with the FWCC I would like to try a hip carry and a back carry sometime soon. Just this last weekend I put Forest on my back in the Ergo and other than him bouncing around a little bit more, he seemed to like it. Oh, he did barf on me from the jostling a bit, but as he gets a little more stable I think that will go away. I do notice that he really enjoys moving and if I stop walking while he’s being carried he will start fussing. There’s a ton of You Tube videos demonstrating carries for all of the various wraps and carriers out there so there’s no shortage of information. Sometimes I watch several videos and learn different subtle techniques for a single carry that each person does. This ended up being far longer than I expected…if you made it through, kudos to you! 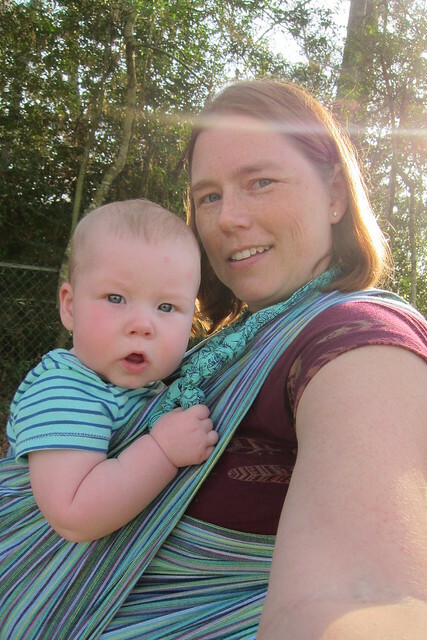 If you are interested in babywearing reach out to a local group or find one on Facebook. 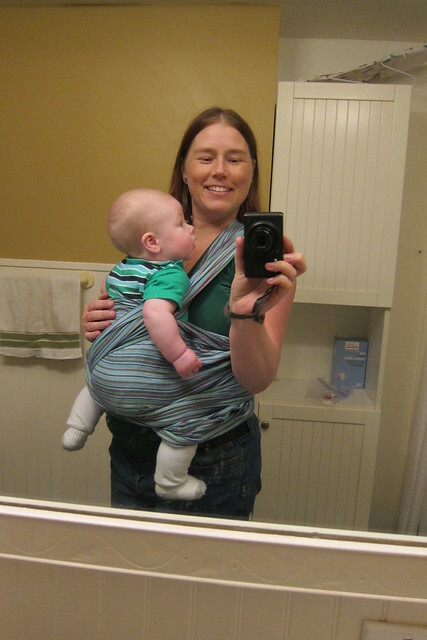 Babywearing 102 is one that is not region specific. I wanted to do this SO badly with Gracie. I really thought since holding/carrying her was difficult, maybe it would be easier going if I had my arms and hands free so I could balance and glide my hand against the wall for additional balance as I moved around the house. But when we tried, it wouldn’t work because it requires a lot of physical balance and core strength, which is a problem with Spina Bifida. I imagined toting her all over with me. It looks wonderful! So glad Forest enjoys it- I LOVE that third wrap. Yes, he is pretty adorable, Chel! 🙂 Sometimes I just want to eat his little cheekies up!